TORONTO — Normally Joe Biagini is the comedian of the Blue Jays clubhouse. He cracks jokes with teammates as he ambles from locker to locker, has made an appearance on the Tonight Show with Jimmy Fallon and can be counted on to give silly answers to reporters. But after he gave up seven runs, six earned, in an inning-plus of work in Toronto's 11-4 loss to the Chicago White Sox on Friday he was quiet, analytical and even philosophical. "Hopefully I don't waste this opportunity to learn from that," said Biagini as he concluded a nearly three-minute answer where he discussed the breakdown of his mechanics, how it had been an issue he struggled with in the minors, and how he can learn from the experience. "I think all the frustration can be channelled into improving yourself and making sure that doesn't happen again, or, very often." Jose Quintana (3-8) was solid for Chicago (30-36), striking out five and allowing five hits and just two runs over seven innings. Jake Petricka pitched 1 2/3 innings of relief, allowing two runs, with Gregory Infante earning the final out of the game. Melky Cabrera hit a three-run homer and a two-run double to lead the White Sox offence. Jose Abreu had two hits and drove in three runs, while Alex Hanson had three hits and scored three times. Biagini (1-6) was followed by relievers Dominic Leone, Jeff Beliveau, Jason Grilli, Aaron Loup, Ryan Tepera and Danny Barnes. Leone gave up a run over three innings and Beliveau allowed three more in his inning. "Obviously, (Biagini) was off, there's no question about that," said Blue Jays manager John Gibbons. "He just had trouble throwing strikes. We've never seen that out of him before. He was on six days rest because of all those off days, no excuses really." Justin Smoak's two-run blast in the ninth inning was too little, too late for the Blue Jays (32-34). Kendrys Morales and Steve Pearce both had solo home runs. It was Pearce's first game back since May 14. He had been out with a strained right calf. 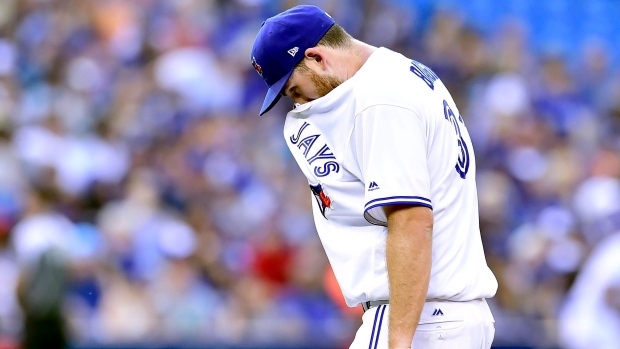 Biagini, who was promoted to Toronto's starting rotation from the bullpen as Aaron Sanchez recovers from blisters and nail issues on the middle finger of his throwing hand, said he closely reviewed video of his performance after being pulled in the second inning. He found that he was not staying with his mechanics, which were affected by him pulling his head away from his throwing motion too early. "It's nicer to at least know what it is instead of having no idea," said Biagini. "All I can hope is that I can use this game to improve my diagnosis of that." Abreu hit a two-run triple to right field in the game's third at bat, driving in Hanson and Cabrera. Todd Frazier added to that two hitters later, driving in Abreu with a sacrifice fly to deep right field. Biagini's rough start continued as Tim Anderson singled to the pitcher's mound and the Blue Jays starter threw it over Smoak's head at first base. The error allowed Matt Davidson to score from second and give the White Sox a 4-0 lead. Cabrera's two-run double in the second inning added to Chicago's lead. Abreu followed that up with an RBI double that cashed Cabrera to make it 7-0 and ended Biagini's night, with Gibbons bringing in Leone. Morales replied for the Blue Jays in the bottom of the second, cutting the lead to 7-1 with a solo homer. Hanson's single through the gap brought in Omar Narvaez from third in the next inning, adding to Chicago's already sizable lead. Pearce answered back in the bottom of the third, hitting a home run just inside the left-field foul pole. The drubbing continued in the fifth inning as Cabrera hit a three-run homer to make it 11-2 White Sox. Smoak brought the few remaining fans in the Rogers Centre stands to their feet with a two-run homer in the bottom of the ninth with two out. He drove in Dwight Smith Jr., to cut the lead to 11-4. Smoak has 19 home runs on the season, tied for second in Major League Baseball. Notes: Sanchez threw in the bullpen before batting practice on Friday as he continues his recovery. He has been out for the past four weeks. ... Announced attendance at Rogers Centre was 39,071.